The parish church of SS. 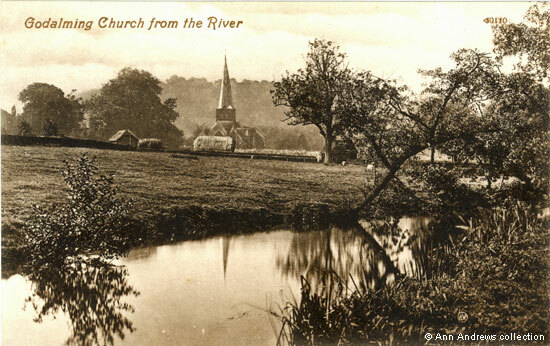 Peter and Paul, seen from across the Lammas Lands, with the River Wey in the foreground. The postcards here provide a good view of the 14th century steeple which sits on top of a Norman and Mediaeval church tower. Although a large hay cart or rick unfortunately almost obscures the church windows, the image also gives a good view of the numerous gravestones in the churchyard to the right of the cart. The two small huts in the picture no longer exist. Whilst it is hard to see through the trees on the right hand side, there is a paling fence bordering Borough Road. Enlargement of the above. An idyllic rural scene. The coloured view of the church below, published by the local firm of G. E. Eaton, provides a better view of the church. At least you can see the windows above the altar! Although there is no date, it was almost certainly produced before the First World War. A curious story about a church bell, that had been passed down through the generations for hundreds of years, was recounted in 1925. It was alleged that during a great storm which struck the church, the church bell was carried into the river, forming a somewhat dangerous whirlpool "into which no swimmer might enter without endangering his life". The local architect Mr. J. H. Norris, F.R.I.B.A., who was addressing the Surrey Archeological Society, said that when he was a youngster the "bell hole" had been pointed out to him and he was advised not to go near it. The story about the bell itself is also recalled by the church historian, Alan Bott, who talks of the English antiquary John Aubrey describing the event in 1676. However, the two stories have probably become merged together. William Veale described a "bell-hole" close to Charterhouse School's Bathing Place on the River Wey, which is some distance upstream from the church, on a sharp bend in the river. The water there was said to be deep, swirled around and deemed dangerous and a child had drowned there. Norris also described how, some three or four years before he talked to the Archaeological Society, he had supervised alterations on the instructions of the vicar and churchwardens. The work involved repairs made to the lead on the 14th century spire which had been damaged by successive storms. But the storms were not the sole cause of the problem. Unfortunately, once the repairs were underway it could be seen that death watch beetle was causing damage to the spire's structure. 1 and 2. "Godalming Church from the River", Valentine's Series, No. 60110. Not posted but card registered in 1907. 3. 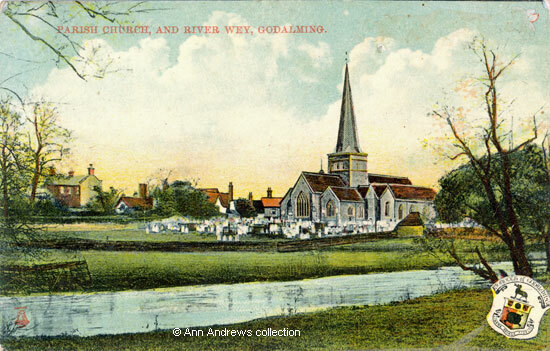 "Parish Church and River Wey, Godalming". S. G. Eaton, Stationer, Godalming. The Milton Post Card. Printed at our works in Germany. Not posted. "A Godalming Walk". The Godalming Trust, 1977. Various reprints and twice amended, the last being 1988 for our copy. "Surrey Mirror", 24 July 1925. Surrey Archaeologists. Excursion into West Surrey. Godalming, Whitley and Rake Manor visited. "A Guide to the Parish Church of Saint Peter and Saint Paul" (1978) Bott, Alan M.A., F.S.A. © Alan Bott and Parochial Church Council of St. Peter and Paul. Edited and designed by David Coombs.